This roundabout has seen many accidents and the safety railings have been damaged many times. I feel a human target as I walk across any of the road crossings in Brighouse. The traffic plan is now inadequate and outdated, frustrated motorists glad to escape the frozen traffic queues give rise to bad tempers and fast drivers leaving the town at speed. The road to Bradford via Bradford Road towards Bailiff Bridge is crowded by cars parked on the pavement and there is an unbroken line of vehicles on both sides of the road. The road has a cycle lane which is neither use nor ornament as cars are parked permanently on the cycle lane. Disabled wheelchair users and people with prams have difficulty negotiating the footpath due to these cars parked on the pavement. The road to McDonalds is also a hazard as cars back up getting into the site at peak times and weekends, causing a traffic jam. Brighouse needs an immediate traffic system overhaul, before a fatal incident occurs: The roads should carry cars; The cycle lane should be for bicycles; The footpath should be for pedestrians. 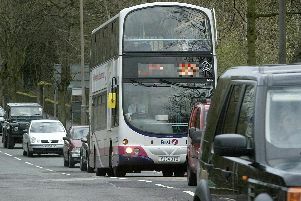 This line is very blurred in Brighouse and the council seem not to notice.